Hi friends! I hope you're having a wonderful day! Today is my husband's birthday. I will be sharing his card after I make it. LOL! Isn't that how it goes? Someday I will make cards before the day of the actual event. Someday. 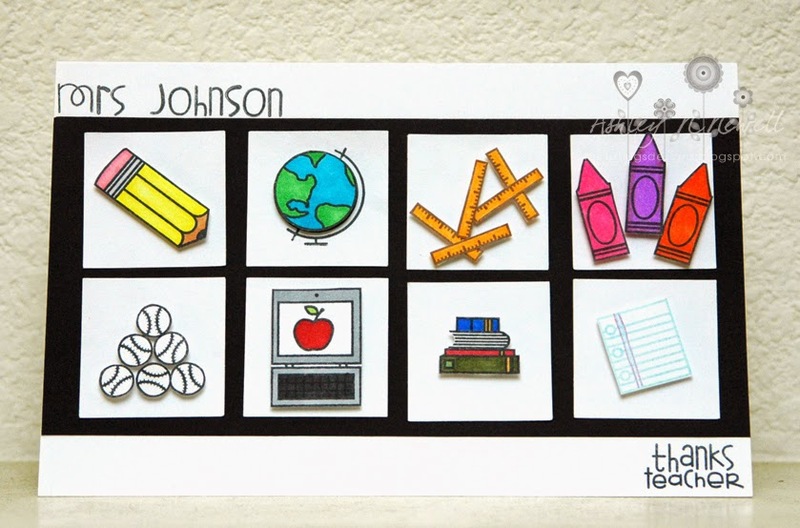 Today, I'm sharing a card I made for my son's teacher to go with her end of the year gift. We went in on a gift with a bunch of other families and I made the card for all the kids to sign. I made a HUGE card since all the kids were signing it. This is 8.5 inches by 5.5 inches. I took a while brainstorming what to do with so much space. I decided to go with a grid of a bunch of things you do in school. Our elementary school teachers also teach Physical Education so that's why the baseballs from Paper Smooches Little Fella are on there. The laptop is from the Teen Routine set. The other images including the little apple on the computer and the thanks sentiment are from Smarty Pants. Then I used my Alphadots set to spell out the teacher's name at the top. I pulled out my Copics for the first time in a long time. My coloring needs a lot of work but you work with what you have. On the binder paper, I used some gel pen. I cut out all the items by hand and used a square punch for the white card stock to display them. I'm linking up this card to this week's Paper Smooches Sparks Anything Goes Challenge. I love it! Perfect design for a teacher....they do a little bit of everything. This will be a huge hit! Cute! Teachers are the best! super fun! such a clever design! thanks so much for joining us this week at Paper Smooches SPARKS! Awesome grid design. So cute ona card.